Most home 3D printing systems use a few basic tools to build objects. First you have a build plate and an extruder. A motor pulls plastic filament through a heated nozzle and squeezes it out, slowly but surely creating layer after layer until you have a 3D-printed Pokemon knock-off. But specialized filament is comparatively expensive, and the raw resource from which it’s made, plastic pellets, isn’t. That’s where the Sculptify David comes in. Created by Columbus, Ohio, natives Todd Linthicum and Slade Simpson, this 3D printer reduces the cost of 3D printing by allowing users to use cheap pellets instead of expensive custom filament. This means you could feasibly use all sorts of materials, from nylon to plastic to wood-based pellets, to print. The team will launch the project on August 20 but they’re planning on selling early bird units for $2,745, a pretty penny but still within the range of standard 3D printers. They’ve created a pre-sale page where users can sign up to be notified when the product is for sale. Pellets offer many distinct advantages, with more material options, higher material quality, and reduced material cost, being the most primary. Basically every plastic product in the world starts out in pellet form, so they are widely available in hundreds of different grades, materials, and colors. Also,since David eliminates the need for spools of filament, materials no longer need to be optimized for a spool – just poured into our system. You could feasibly use any color plastic in the machine and even use multiple kinds of plastic. The print bed is heated so you can print ABS and other chemical plastics, as well as starch-based PLA and other composites. 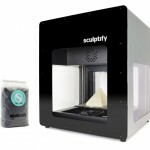 Does this make it better than any other 3D printer on the market? Potentially, if it means you can print more materials more easily. The founders were Mechanical Engineering majors who worked at major automotive companies in the past. They’ve been working on David for most of the year and are ready to start mass producing in Ohio. “We want to start a business, not make quick money off of a project, and we are dedicated to making that happen. We plan to offer sales of production units after our Kickstarter units have shipped,” said Simpson.